Charlotte Sakai at the abandoned family nursery. Flowers still growing in one of the Sakai greenhouses. The Oishi nursery’s deserted greenhouses. “Blossoms and Thorns,” a documentary about the Nikkei nurseries in Richmond, Contra Costa County, had its public premiere in July at the Rosie the Riveter/WWII Home Front National Historical Park’s new Visitor Education Center in Richmond. Once a dominant force in the Bay Area floral industry, the nursery families suffered a blow when they and other Japanese Americans were interned during World War II. They re-established themselves after the war, but had to relocate again because of the building of Interstate 80, and were ultimately driven out of business by cheaper imported flowers. 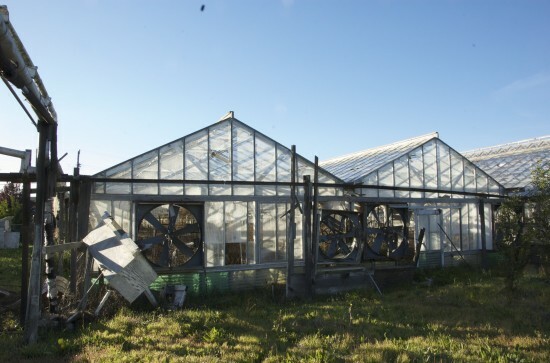 The abandoned greenhouses have stood as reminders of that nearly century-long history. 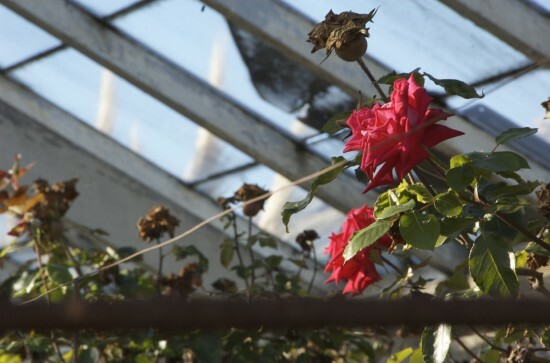 The story behind the greenhouses is little known to the general public, and even in the Japanese American community many are unfamiliar with it. “Blossoms and Thorns” is part of an effort to change that. Between screenings, a panel discussion featured L.A.-based filmmaker Ken Kokka, cultural historian Donna Graves of the Preserving California’s Japantowns project, and members of several nursery families. 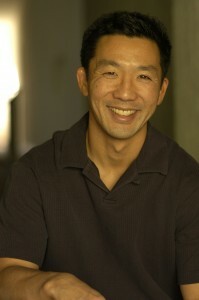 George Kiriyama of NBC Bay Area, who narrated the film, served as moderator. The event was co-sponsored by the Contra Costa JACL, Rosie the Riveter/WWII Home Front National Historical Park, Rosie the Riveter Trust, and Richmond Arts and Culture Commission. 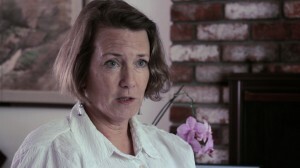 A private screening of the documentary was held in June at East Bay Free Methodist Church in El Cerrito. Speakers included Kokka, Graves (co-producer of the film and also an interviewee), interviewee Linda Aebi Hale, and Contra Costa JACL’s Don Delcollo (president) and Chizu Iiyama. A copy of the film was presented to Tom Leatherman, superintendent of Rosie the Riveter/WWII Home Front National Historical Park. Kokka has numerous credits as a visual effects producer, including the blockbusters “Armageddon,” “Immortals,” and the “Twilight Saga” films “New Moon,” “Eclipse,” and “Breaking Dawn” (Parts 1 and 2). In an interview, he explained how he got involved in “Blossoms and Thorns”: “I came to make this film in a somewhat roundabout manner. Although I grew up in Berkeley, I do not have any direct ties to the JA flower-growing community, so I was not even aware of their existence until I left the Bay Area for graduate school in film production in 1999. While at UCLA, I decided to adapt a Toshio Mori (1910-1980) short story called ‘The Chessmen’ into a short film. 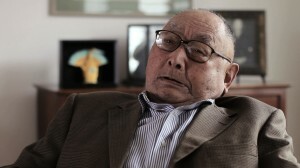 “Mori was the first published JA writer (by a mainstream publisher), according to many sources. He lived in the East Bay, I believe in San Leandro, and he supported himself through his family business as a flower grower. His book ‘Yokohama, California’ (1949) had many stories about growing flowers. I found ‘The Chessmen’ particularly engaging, as it depicted the struggles and hard work required to survive in the flower business. Produced in 2005, the film features Irene Furukawa as Mrs. Hatayama, Ken Takemoto as Yosh Hatayama, Michael Yama as Mas Nakagawa, and Martin Yu as George Murai. Nursery families were represented in “Blossoms and Thorns” by Tom Oishi, William Sakai, Flora Ninomiya and Ruby Adachi Hiramoto. Among those serving on the Contra Costa JACL Video Committee are Ninomiya, James Oshima, Charlotte Sakai and Larry Oishi. “After I finished the film (‘The Chessmen’), I was fortunate to have several people champion it,” Kokka continued. “In particular, Tom Panas of the El Cerrito Historical Society was very supportive; he told me that the film spurred him to learn more about the local flower-growing community, which in turn led him to become active in preserving what he could of that history. 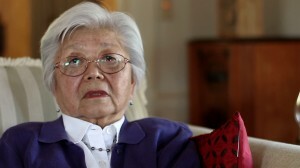 Local activist Chizu Iiyama became aware of his efforts and thought that the JACL should take an active role in that preservation. The project, which was announced during the “Blossoms and Thorns” exhibit at the Richmond Art Center in 2010, took a while to complete because of Kokka’s day job. There was enough material to make a much longer film, but as the length was kept to 19 minutes, some choices had to be made. “My favorite part of the process was having the opportunity to interview the participants, to capture their memories and feelings of that period of time,” Kokka said. “I never had the chance to speak with my grandparents on either side of the family about how they felt about being interned; and my own parents were not yet teens when they were interned. The documentary also tells the touching story of the Aebi and Ninomiya families, who were neighbors and rose growers. While the Ninomiyas were interned, Francis Aebi, who is of Swiss descent, took care of their nursery. When the government required flower growers to grow produce instead, Aebi converted both his and the Ninomiyas’ greenhouses, and gave them their share of the profits when they returned. 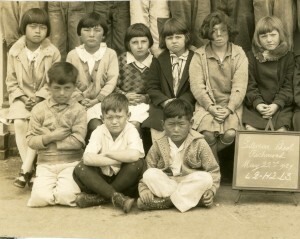 Tom Oishi (front row, right) at Pullman School in Richmond in 1929. Kokka’s least favorite part of the project was having to leave so much out of the final cut. “The eventual fate of the Richmond nursery growers is very interesting — many of the nurseries reopened after World War II, only to be forcibly relocated again by the government to make way for Interstate 80. The U.S. government eventually drove most of the growers out of business by supporting South and Central American growers and their imported flowers. By the end of the 1980s, most of the growers had sold their property, and these family-run California businesses were vanishing. The National Park Service will offer the video as part of its permanent collection. The NPS also helped produce a documentary about Rosie the Riveter, a symbol of the women who worked in shipyards, airplane factories, ammunition plants, railroads and other defense plants during the war. “Richmond is notable in part for its growth during World War II and its significant contributions to the wartime effort,” Kokka noted, “but there is a darker side to that time period, and I think it’s commendable that the NPS is trying to present that story as well. The team that put the film together also included Bill Basquin and Eric Leven (camera), Kim Christensen (sound design/re-recording mixer), Chris Wong (composer), Page Frakes (color correction), Mike Cavanaugh (post-production consultation), Fantasy Studio (voiceover recording), and Mari Nakamura (graphic designer). Photos courtesy of Ken Kokka. This article originally appeared in NikkeiWest. 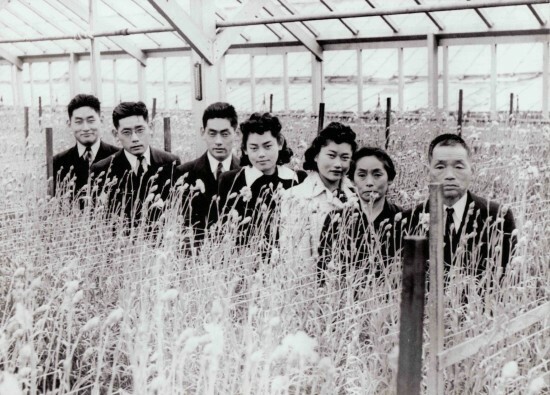 The Oishi family in one of their greenhouses in Richmond in 1940. From left: Tom, Joe, George, Lucy, Hana, Riu and Seizo. From a California Flower Market photo album. 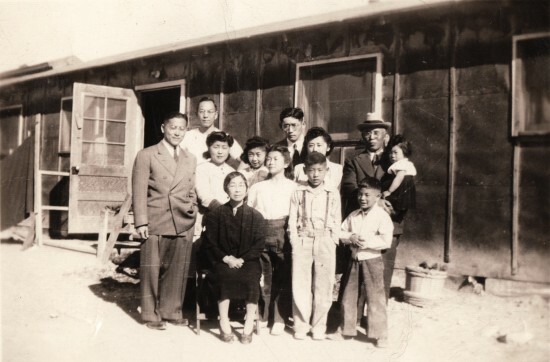 The Oishi family in camp. Nice piece, JK- when I first read the headline, I was thinking to myself–ooo, I hope the filmmaker included something about Toshio Mori. Upon reading the article, I was delighted to see that said filmmaker is none other than Ken Kokka, who I talked to years ago about adapting Mori’s short story, The Chessmen. 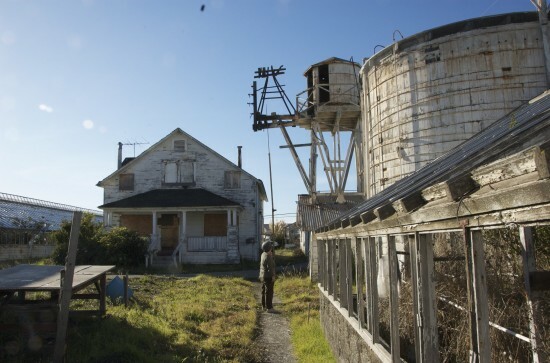 I’m glad he worked with Donna Graves and is giving voice to those haunting glass hothouses in Richmond that poetically suggest stories of acculturation, abandonment, and agriculture all in one.